President of the Democratic Republic of Congo Joseph Kabila at the U.S. Africa Leaders Summit, Aug. 5, 2014 (AP photo by Susan Walsh). On Sept. 27, street demonstrations in Kinshasa, the capital of the Democratic Republic of Congo (DRC) drew significant if not overwhelmingly large crowds. The target of the protesters’ ire was President Joseph Kabila, whose loyalists had spent a busy summer testing public opinion on a controversial issue: amending or even replacing the country’s constitution to remove presidential term limits. 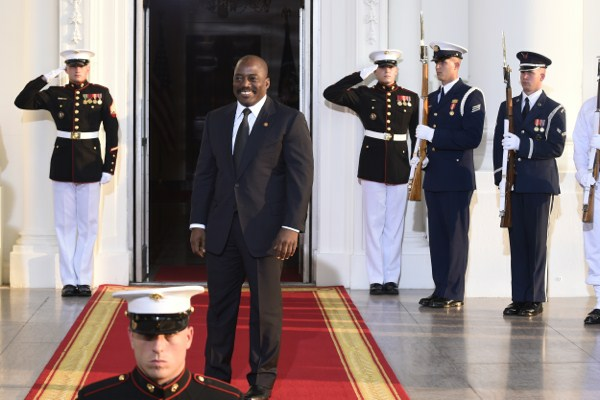 The subject is of more than academic interest to Kabila, who is fast approaching the end of his final term in office, having assumed the presidency upon the death of his father in 2001 before winning elections in 2006 and 2011. On the question of constitutional change, however, the national mood was unequivocal: a loud rejection of the idea, from civil society, opposition politicians and even some members of the ruling coalition, the People’s Party for Reconstruction and Democracy (PPRD). Undeterred by this discouraging response, the president’s advisers have pushed on regardless.